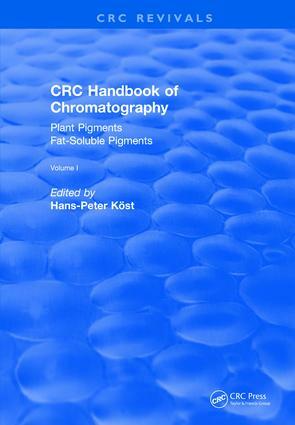 The CRC Handbook of Chromatography is a series of work-bench references for scientists and researchers using chromatographic systems for the analysis of organic and inorganic compounds. This handbook is an assemblage of tables where, besides data obtained by modern separation methods, older sources often difficult to access have been included to give maximum information. For use in scientific research and routine analysis where the exact determination of plant pigments, because of their light absorbing properties and defined tasks, is necessary.